3 sets GN fast removable mud recycling system for HDD rigs will be dispatched to the client this week. It is customized system for CPP rigs. CPP engineering team visit GN factory and check the system before dispatch and very satisfied. They are happy with the system quality and thanks very much for the continue technical supporting of GN Solids Control for the years. 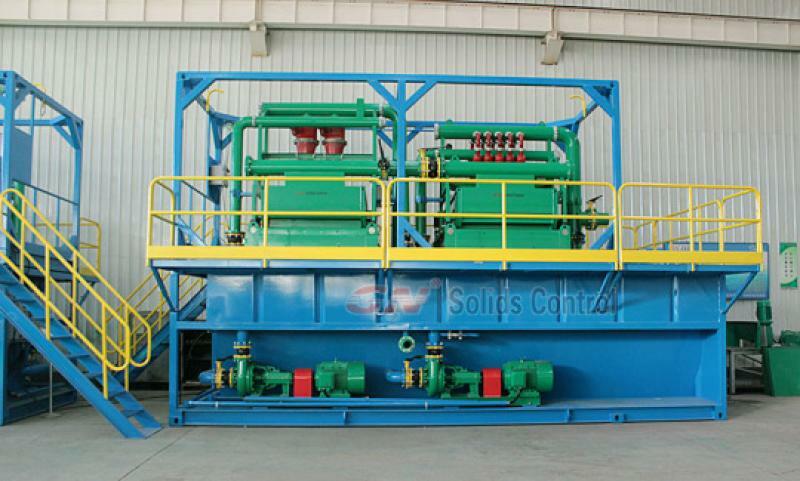 Till now, they have over 35 sets compact mud recycling systems from GN Solids Control. Most of the systems are for 500GPM capacity. The 3 new systems are customized with 500gpm capacity also, but can up to as 1000GPM mud system capacity when needed. 1) Mud tank 1 ea. The size of the tank is the same with 20ft standard container, and equipped with ISO blocks. Walkways and handrails are all foldable type design for fast movement. During inland shipment, the users no need to remove the walkways and handrails, they only need to take off the pin shaft and supporting beam of walkway, and fold up the walkway and handrails to the tank side wall. 2) Mud cleaner desander (model GNZS706E-2S) with double deck shale shaker. It is the combination of a double deck shale shaker and 2 each 10’’ desander cones. The bottom shaker deck can be used as solids control shale shaker for preseparation. 3) Mud desilter cleaner (model GNZS706E-8N) with a double deck shale shaker underneath. The bottom deck of the shaker will be used as solids control shale shaker. The 1 ea desander mud cleaner and 1 ea desilter mud cleaner are mounted in a lifting frame, they can be moved as a compete part during shipment when needed. 4) Feeding pump for desander and desilter cones are mounted in the slope of the mud tank for a compact design. For other sizes of GN mud recycling system for HDD rigs, please you visit GN website or contact GN company for details.